In my experimentation with this tool I used to confirm that this new headless browser Googlebot seems to accept and store cookies, and send them back to your server too (as well as referrer headers). 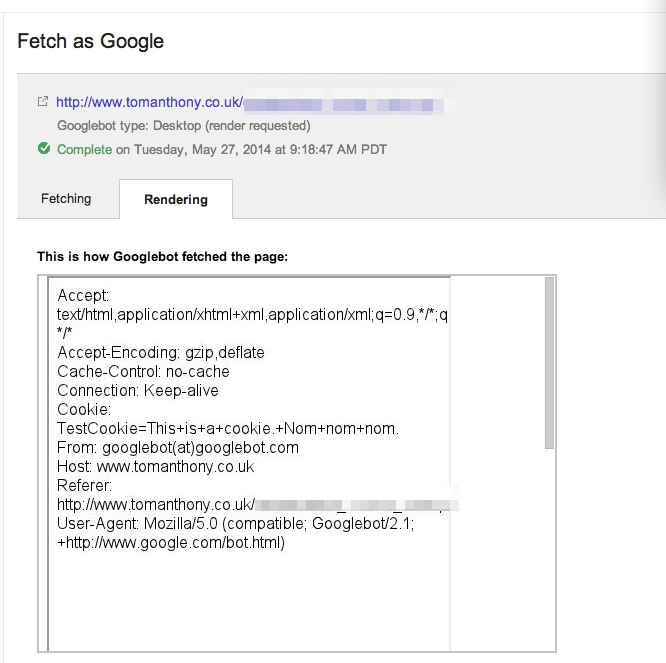 You can see that sure enough Googlebot sends back a Cookie header with the value I had set in the ‘outer’ script. It sends a Referrer header too. So far it is too early to tell. Google doesn’t keep the cookies between runs of the tool, so it really depends how they treat things when actively crawling pages. If crawling multiple pages like a single run of the tool then we should see cookie affected results appearing in the index, but it might be that Google crawls each page separately in a different ‘session’ and then this won’t change very much. I notice same yesterday. So far only bot that use this is for “Fetch and render”. I don’t think that this will affect main bot because they are cookie-less and referrer-less just as other bots on the internet. It appears that the regular googlebot (not Fetch tool) is now sending referer headers when it requests page resources (have caught it sending them on requests for CSS and JS files). Thanks for the info, bro. I usually don’t check or use webmaster tools (I need to!) so would be hard for me to notice this change. Although I don’t use it, this info is gold for me. I was not aware about this. It is good for many that Googlebot has started accepting cookies. Now crawling can be tracked easily.